Chatham-Kent Hydro has recently embarked on a campaign to replace the hydro meters for 32,000 of the utility's customers with new smart meters. Mandated across the province by 2010 as an energy saving measure, the devices record the hydro usage during various time periods throughout the day and transmit the data to the billing computers using a wireless mesh system. Hydro has claimed to be ahead of schedule and under budget, while promoting themselves as leaders in the industry that others are trying to emulate. Once fully deployed, hydro expects the cost to be $4.6 million, which is incorporated into customers' bills. Your browser settings are preventing this control from showing. Download the file here. Listen to typical smart meter interference as heard on cordless phones or baby monitors. Wireless headphones and phones are useless even 2 meters from the base. This is not the equipment's fault. Hydro claims that users of 900 MHz equipment will hear only about one pop every minute, when there's actually over 100. Also available here. MHz = MegaHertz, or a million cycles per second. GHz = GigaHertz, or a billion cycles per second. Hydro, however, thinks that simply using Industry Canada certified equipment gives them the same protection as a licence. Dan Charron of Chatham-Kent Hydro states, "The nature of the 902 MHZ band and its rules of use means interference from other devices seems to be an inevitability. Thankfully, as time goes on, less and less devices will be operating in this band as most commercial products seem to be moving onto the 2.4GHZ and 5.8 GHZ bands." Indeed, smart meters do cause significant interference to 900 MHz equipment, heard as loud pops and crackles up to a hundred times per minute. While Hydro has never publicized the fact they knew in advance that these smart meters would likely cause problems to consumer devices, many residents have reacted by discarding perfectly good electronics thought to be malfunctioning. "My phone was popping in my ear so badly I couldn't hear anyone, so I threw it away and bought a new one," stated Helene Hanley of Chatham. Industry Canada, the government agency which regulates radio frequencies, was initially unaware of Chatham-Kent Hydro's use of the 900 MHz band. Even though they certify the individual components, a municipality-wide mesh network using the modules to monopolize the entire 900 MHz band was never envisioned. Industry Canada stated that while such use seems to be permitted under present regulations, there's no guarantee that Chatham-Kent's smart meters will remain legal under future rules. They have expressed particular concern that one user has wastefully taken over the entire band. "Unlicenced users must not cause interference to other licenced or unlicenced users on the 902-928 MHz band," stated an Industry Canada representative. "Even though equipment is certified, it is not guaranteed to comply with regulations as installed. Causing interference to other devices is illegal, though our department does not intervene in cases of problems between unlicenced users." Industry Canada also advised that a more appropriate frequency was available specifically for smart meters. For less than a penny per customer per year, the meters could have had exclusive use of licenced and protected channels at 1.43 GHz created specifically for smart meters, an option ignored by Hydro. "We weren't even aware that 902-928 MHz was being used for this purpose in Chatham," he added, "It's a very dangerous thing for them to do. There's no long-term life with that type of system." In North America, the frequencies used by local smart meters are allocated to Amateur Radio, a volunteer resource that serves as a backup emergency communication system. Plans have been underway to install legal radio equipment in Chatham which could render the smart meters useless. Ontario Energy Board guidelines suggest that 900 MHz was a weak option and recommended that a propagation study be conducted to determine if the 900 MHz band was feasible, including consultations with existing users. "Amateur Radio was not consulted," stated the Chatham-Kent Amateur Radio Club. "This band is ideal for emergency high-speed data, voice and television communications," stated a local operator, "a high-power television system is already in operation in Ottawa, and a similar station has been planned in Chatham for months." With 2000 times the transmitter power used by smart meters, the entire system could be shut down by a legitimate licenced user. Despite being warned of potential problems in September, Hydro has refused to release information to help coordinate the shared use of the band as legislated. Instead, they are pressing ahead by ramping up smart meter installations and issuing glowing press releases. Statements from a hydro official recently printed in a Chatham This Week article show that the local utility doesn't really understand radio technology, and seems to be misleading the public. Most cordless phones use this range. The gaps between the powerful interference peaks are too small to use, resulting in interference across the entire band no matter which channel is chosen. Industry Canada has asked qualified local technicians to conduct additional tests such as this time-lapse spectrum analysis. In specific, Hydro stated that the unlicenced 900 MHz band doesn't offer protection from interference to anyone, and people can always change the channel to avoid it. Industry Canada rules state that unlicenced devices "must not cause interference" (RSS-210). Hydro fails to mention or understand that the smart meters use the entire band, without leaving a single solitary blank channel for consumers or Amateur Radio operators to use. Hydro further asserted incorrectly in the article that a licence is secured to operate the smart meters, when in fact that licence is actually for a data channel on a different frequency, not the smart meters. The recommendation to use 900 MHz smart meters likely came from consultants at Tantalus, the same BC vendor which is also supplying the meter technology, raising additional questions about whether Tantalus was in a position to offer an unbiased justification to use their products. The electrical engineers on staff at hydro would have little experience with radio technology, thus probably finding it easier to just accept the proposed option without recognizing it to be clearly inappropriate. Ultimately, Hydro is continuing to rush the installation of a system with no life expectancy, and could even be subject to a "cease transmitting" order from Industry Canada following ongoing rulemaking with the Radio Advisory Board of Canada. It's clear that $4.6 million may be wasted on a short-lived system that might need replacing at customers' expense within a few years, perhaps at twice the cost to ratepayers. Then maybe the other utilities will wish they didn't look to Chatham-Kent Hydro for leadership. Postscript: Chatham-Kent Hydro thanked me by demanding a deposit on my account to the maximum allowed, even though nothing was owing. After my research came to council's attention, Hydro changed the rules and forced me to pay even more. Their website even displayed two separate versions of the Hydro deposit policy. I was threatened with disconnection if this deposit was not paid with a few days, even though there was no balance on my account. In my opinion, this was clearly retribution for bringing the matter to the public's attention. 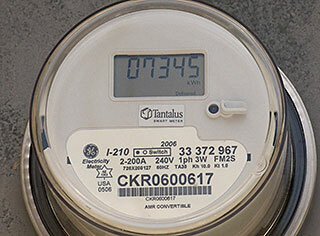 Update - Chatham-Kent Hydro officials responded to council inquiries recently over interference caused by smart meters. Their answers were evasive and seriously misleading, and completely failed to address public concerns. According to Jim Hogan in conversation with myself, Hydro did not understand the magnitude of the problem, and had no idea that the interference would be so bad, which is not what he told council. Other than reducing the number of times each meter transmits, nothing has been done to date to solve the problem.